This is a free 5th grade lesson about subtracting mixed numbers with like fractional parts (same denominator). The lesson teaches an optional subtraction strategy where we use a negative fraction. The previous lesson presents two other, more common subtraction methods (regrouping and subtracting in parts). First subtract the whole numbers, then subtract the fractional parts. You may get a negative fraction. Treat that as another subtraction problem, and subtract once more to get the final answer. 1. Subtract using any strategy. you use ¾ kg to make meatballs. How much beef do you have left? 3. Subtract. Then write an addition that matches with the subtraction. 4. Find the missing minuend or subtrahend. 5. Subtract using any strategy. Color the answer squares as indicated. 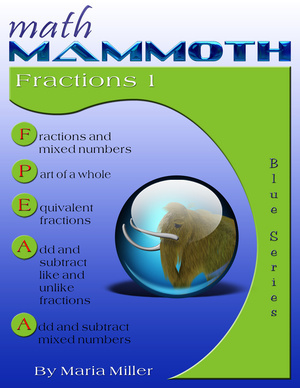 This lesson is taken from Maria Miller's book Math Mammoth Fractions 1, and posted at www.HomeschoolMath.net with permission from the author. Copyright © Maria Miller. A self-teaching worktext for 5th grade that teaches fractions and their operations with visual models. The book covers fractions, mixed numbers, adding and subtracting like fractions, adding and subtracting mixed numbers, adding and subtracting unlike fractions, and comparing fractions. Download ($3.50). Also available as a printed copy. Learn more and see the free samples!